Imitation is the highest form of flattery. 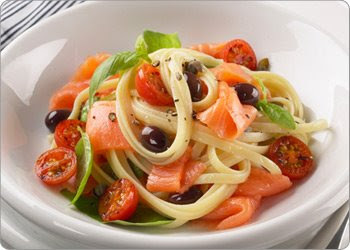 So I hope Patrizio's (Dallas based Italian restaurant) feels very flattered that I tried my dead-level best to recreate their pasta with smoked salmon and capers. This dish can be prepared in less than 20 minutes, and is light enough for the warm weather that is sneaking up on us. If you can enjoy this dish outdoors with a glass of white wine, I highly recommend it. Pasta with Smoked Salmon and Capers (and a few other things) serves 6-8 servings 1 half sweet Vidalia onion, finely chopped 3 garlic cloves, minced 1 bunch green onions, chopped 3 tablespoons extra virgin olive oil 2 tablespoons capers 2 cups sliced cremini mushrooms 1 cup sliced grape tomatoes 1/2 cup heavy whipping cream 1/2 cup white wine 1 large package of cold smoked salmon, roughly chopped into 2 inch sections 1 standard package of pasta of choice (linguine or spaghetti work well) Boil salted water and cook pasta to desired tenderness. In a very large pot (large enough to add pasta to the sauce) saute onion and garlic in olive oil, until it is translucent, but not browning. Add green onions, mushrooms, capers, cream, and wine, and heat for 3 minutes. Add smoked salmon and tomatoes to the mix, stir and remove from heat. Drain water from pasta, and add pasta to sauce. Mix well. Serve and enjoy!